Over the years, there has been much developments with managed accounts, and with it has brought on a myriad of terminology and acronyms that unlike the firm ‘legally defined’ boundaries of a ‘unit trust’, the boundaries and differentiations are somewhat less rigid, and in many cases overlap. Many have been confused by this, which has also been compounded with proprietary uses of terms for marketing or product and service naming. However in recent times, there does appear to be some gravitation to some generally accepted terms with managed accounts, and below is my best way to help a new comer best understand and differentiate managed account terminology. I also have included some observations about the evolution of managed accounts and where they appear to be heading. Each of these are described below and you can click on the links above for quick reference. Comments and corrections welcome.. Enjoy ! Managed accounts with standing instructions – these are typically ones that have ‘do not buy’ and ‘do not sell’ instructions around specific investment securities and are fairly black and white in terms of rules based behaviours. These are characteristics of what are often called ‘Mass Customised’ managed accounts. Managed accounts with behavioural instructions – these are typically ones that define behaviours around the operation of the managed account portfolio management and trading operations and often include rules like setting minimum trading parcel sizes. Managed accounts with objective based instructions – these are typically managed accounts where objectives around specific clients situations may be set, and act as overriding styles or methods that should be considered across the board when adjusting a client portfolio. Such may be ‘only accept discounted capital gains’. Self held investments – where the investment securities within a managed account are actually held legally and beneficially in the name of the investor. Custodial held investments – where the investment securities are often held legally by the custodian on behalf of the managed account scheme or the investor. Custody is well established model that has been around for a long time, however as more and more technological developments occur (an even the possible introduction of blockchain technologies soon) the benefits of the safe ‘custody’ may being be diminished. As managed accounts have grown over the years, there has been a natural desire then to not only view and managed investment portfolios of pools of monies into a managed account structure, but also the desire to look at the aggregate of managed accounts across multiple different house hold accounts. This raises a number of permutations of how house hold assets can then be managed whether they be aggregated before being managed to an investment strategy, or whether each household account is managed to a strategy and then aggregated for reporting purposes, and various combinations of the above also. It is observed that households with larger asset values are both seeking and receptive to these multiple account structures as they support asset protection, structuring and tax advantages in some cases also. Over the years, there has been plenty of jargon and acronyms introduced associated with managed accounts, some of them defining something that is a regulatory structure (or nearly), and some describing essentially a product or service offering. SMA (Separately Managed Account) – SMAs arrived as the first productised managed account structures, with the benefit of each investor seeing the investments they held as a proportion of a pooled investment structure. Like all managed accounts, they provide a more transparent way of investors seeing what specific investments they own, and often the benefits of being able to port the investments out of the SMA should the investor wish. As a first entrée into managed accounts as a product, the SMA proposition was first off the rank. Many SMA’s use portfolios of listed securities, however like most managed accounts they are generally not restricted to such. 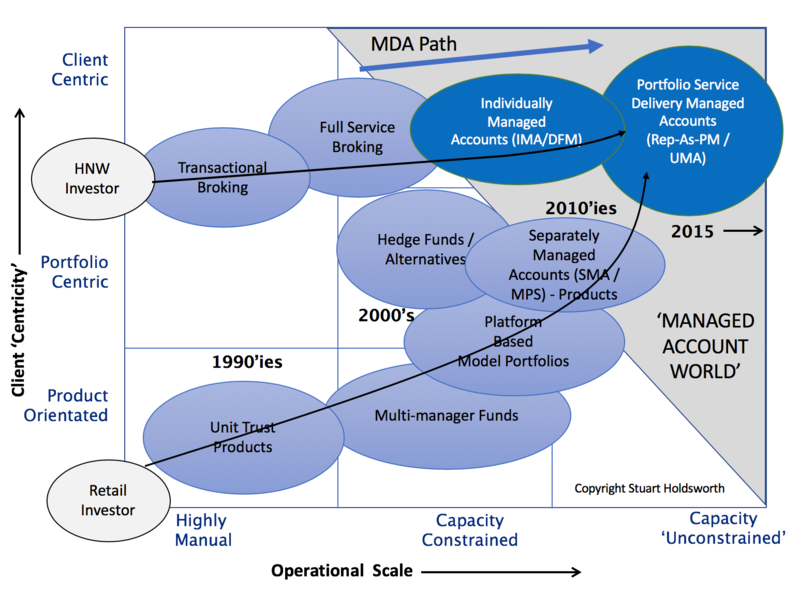 MDA (Managed Discretionary Account – Unlike SMAs that are typically within a product structure, MDAs really describe a way that a managed portfolio is operated, typically identified by the name and fact that someone has a discretionary ability to alter the clients portfolio as agreed with the investor client. MDAs are often therefore defined in regulation as the transfer of authority of discretion is something that has risk associated with it. Because MDAs are a way that a portfolio is managed, they can extend beyond model portfolio security based propositions to include areas like FX and derivative trading. IMA (Individually Managed Account) – IMAs is a name that is derived largely from the investor experience in that it is usually an experience that is tailored around the individual client. IMA is not a legal definition in any way, and hence IMA is more a marketing term than anything that defines a product or regulated structure. Because of the phrase ‘individual’, most IMA services are therefore geared around a high level of personalisation of the experience to the client, the way that they desire to hold their assets, and are put in perspective of how a firm offers an IMA, whether advisory or discretionary. Because an IMA is tailored around an individual, and the work and judgements often associated with such, IMAs are usually for high net wort or institutional portfolio sizes. IMAs may contain broad ranges of investment securities from funds, stocks, bonds, cash, trusts etc. UMA (Unified Managed Account) – Like an IMA, a UMA is not a term enshrined in regulation, but more a service description term. UMAs can be seen as often the extension of SMAs and IMAs together and are typically for high net work portfolios that are seeking a level of personalisation around asset allocations, with often SMA type portfolios for each asset class. Sophisticated UMAs may support the aggregation of assets from various household accounts into a blended overall portfolio with either SMA or IMA like ‘sleeves’ for more specific account / asset class portfolio management. DFM (Discretionary Fund Manager) – The term DFM is broadly used in the UK to describe a discretionary managed investment portfolio, and in many ways can be regarded as similar to SMA or IMA operated with MDA type operations. Because of the way that these terms arrived, there is not a close correlation between them and the overlap can be confusing. Because of the tax advantages of holding assets in funds in the UK, DFM portfolios are often portfolios of underlying managed funds although can contain securities, bonds and other instruments also. DFM providers typically serve the higher end of the market with a more personalised approach, although many have started MPS offerings (see below) for the broader market. DFM solutions have some advantages of ‘Fund of Fund’ propositions in that they provide a more descriptive and transparent experience for the consumer and adviser. MPS (Managed Portfolio Services) – MPS services in the UK are generally DFM services that typically have little or no level of personalisation but manage an investment portfolio to a set model portfolio mandate of funds or securities. ‘Rep-as-PM’ – is a term used in the USA where a representative of a firm manages an investor portfolio directly rather than putting the client into a more productised alternative like an SMA. Rep-as-PM as a proposition has grown considerably over the years as it allows a more direct adviser to client relationship and also reduces the necessity of product structures (like for SMAs) allowing more margin to go into an advice firm as opposed to third party product providers. Below is a table with a best comparison of managed account types. Clearly this is not a ‘black and white’ landscape.. Managed accounts have developed through the introduction and advancement of technology, and with that advancement, the type and nature of managed account offers has developed, evolved and transformed. Below is a summary diagram of the key developmental paths that we have observed managed accounts evolve. One of the key barriers in the development of managed accounts is the transition from a ‘product’ mentality in their operation to the more recent managed account offers that operate with a high degree of ‘service delivery’ to clients. This is a key evolutionary step in line with most industries that move from product focus to service focus, and create complexities for operations and technologies.